What type of helmet? Well, the Imperial Gallics really do look the part, but the Coolus is easier and cheaper to get hold of. Pompeii or Mainz pattern sword? Or something more obscure? And finally, the really big ones. Lorica segmentata or lorica hamata? And if the latter, do you buy it or make it yourself? After a period of dithering, the decision for me came down to choosing between the cost and potentially long wait for segmentata (though it looks stunning) or taking the Taurus by the horns and making my own chain mail. I plumped for the latter option, which is how I came to write this article. 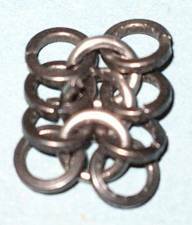 The first thing to sort out was how exactly to go about making chain mail. It's not the sort of thing you can find out in a book from W H Smith's. There are a few stages on the way to getting some answers. Ask them both several times how easy it is, as you keep forgetting and worrying that it will be all too difficult. Get one of them to show you and perhaps let you have a go. Discover that they really are friendly and won't bite, even when you ask stupid questions. Gird your loins, take the plunge and buy a small quantity of material, plus the necessary tools, to have a go at making a small piece yourself. Don't be fooled by the ease with which you join up the links, instead observe how long it takes to make your small sample. This is generally the time to run away screaming. If you suffer from a stubborn refusal to look facts in the face, and share a house with people who don't mind irritating clicking noises whilst watching the tele, decide to press ahead with it all. 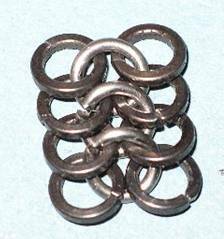 The basic principle of Roman chain mail is that each link is connected to four adjacent links in a regular, repeating pattern. This is built up to form a sleeveless 'shirt', coming down to about groin height (this is correct for our period, the 1st Century AD). There are some differences depending on whether you are a Legionary or Auxiliary. Legionary mail should have shoulder doubling whereas this is optional for Auxiliaries. Legionary mail is made up of two types of link, one with a square profile and one with a round profile. Auxiliary mail is made up solely with round profile links. 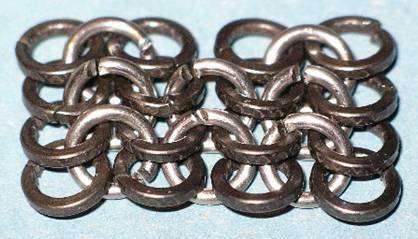 The following is a description of how I made my legionary chain mail. This is a fairly standard mail shirt for our purposes. There are undoubtedly a huge range of possible variations on this theme (different link size, link thickness, link material), again your friendly neighbourhood chain mail expert can advise if necessary. Always seek advice from within the unit on where to obtain materials. Most or all of what you require can be bought at very reasonable prices from within the unit, saving you worry as to whether you've got the right stuff and time finding suitable suppliers. A reel (at least 500m, probably more) of welding rod, 1.2mm diameter. You will need to double the quantity for auxiliary mail. 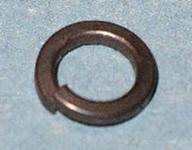 30,000 to 40,000 M4 spring washers (legionary mail only). Don't, under any circumstances, pop down to B&Q for hundreds or thousands of little packets! 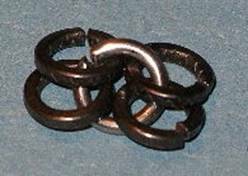 Clasps to secure it at the front (I got mine from Fatalis). A means of securing the doubling to the main shirt at the back. String is commonly used, though I used larger and stronger round links (6mm in diameter and 1.5mm thick). Again, seek advice from within the unit on suitable tools. It is prudent to pay a bit extra for high quality tools as they take a real pounding! At least two pairs of pliers for bending the links into shape. I ended up with two smallish pairs of snub nosed pliers, plus long nosed pliers for some of the really fiddly bits. The snub nosed pliers need to be quite small but also very sturdy. The gripping faces need to be toughened so the links don't chew them up too badly (the cheap ones I bought initially were quickly damaged). Again, check there is no lateral play in them. Afrinus recommends cutting a diagonal groove into one corner of the pliers to improve the grip on the links. These are easy, but also the most mind-numbingly boring part of the job! Take your M4 spring washer, grip it firmly on one side with one pair of pliers, then use the other pair of pliers to bend the washer flat. You will need to "over-bend" the washer as it will spring back when you let go (that's why they're called spring washers). With a bit of practice you will be able to bend it just right so that it is nice and flat when you let go. 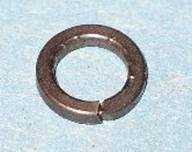 If you are making auxiliary mail, you will do something similar but starting with an open round section link instead of an M4 spring washer. These are a bit trickier! The first stage is to form the welding rod into something that looks like a tightly coiled spring. Then this is stretched out and cut into individual turns, each of which forms a link. Firstly, fix the 4mm bar firmly into the chuck of your electric drill. Then uncoil about 3m of the welding rod, making sure that it won't get caught up on anything as you coil it onto the bar. Secure the end of the welding rod into the chuck of the drill (I poked it into the gap between the jaws of the chuck then bent it over so it is ready to be coiled round the bar). Wear suitable protective gear (thick gloves and eye protection as a minimum) for the next bit as the rod can twang around quite alarmingly! You will also need to have your cutters to hand before proceeding. Keeping the free welding rod in place with one hand, operate the electric drill at the slowest possible speed to coil the rod onto the bar. Keep the turns tightly packed, i.e. each turn touches the adjacent turns. Stop when the coil has nearly reached the end of the bar, then cut the free end of the rod about an inch from the bar. Be very careful doing this as the tension in the coil makes it unwind a couple of turns as soon as it is no longer restrained by the uncoiled welding rod. So keep your hands clear and be ready for sparks to fly! You should now have a coil of the welding rod 4mm in diameter and 1.2mm thick. NB it obviously makes sense to make up a number of coils at one sitting, as this takes quite a bit of setting up. When you are ready to make some links, first make sure you are on your own or you have issued ear defenders to your partner. Then grab hold of the two ends of your coil with your pliers and stretch it out until there is a decent gap between adjacent turns (you will need to get the closed links through this gap when making the mail). Trial and error is the only way to be sure you're getting this right. Finally, use the cutters to cut the rod into individual links. It is important to cut each link with the cutters at the same angle and with the cuts lined up, otherwise you might not be able to get the links to close (if the ends overlap) or they may end up with a gap in them. Again, trial and error (and a lot of practice!) is the only way to get this right. There are various ways of making the mail. All typically involve making up smallish pieces and then joining them together. I have set out the method I followed (courtesy of Bvt) though others have different preferences. Start off with one round link. Hook four square links onto it then use your pliers to close the round link. Repeat this ten times so that you have ten 'molecules'. Now take one 'molecule' and arrange it as shown below. Pretend this is Mickey Mouse with the upper pair being his ears and the lower pair being his cheeks. Add eight more molecules in the same way end to end. 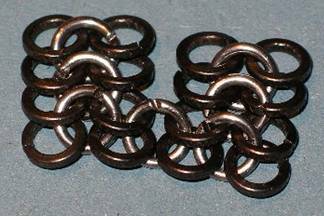 Once all ten molecules have been joined you will have a strip of chain mail, with two rows of square links (20 in each row) and a single row of round links down the middle (19 links). The next step is to make up more strips and join them up end to end to make one long strip. Before you can do this, you need to know how long it's going to be! The strip will go horizontally around your body, so the starting point is your chest size. Add 2" onto this to provide enough slack to get the mail over your shoulders (remember, it doesn't have any 'give' in it at all once the links have been pulled tight). If you are thinking of having a leather subarmalis, add another 2" on top. Above all, if you are in doubt make it a bit too big rather than a bit too small. Spread out one basic strip as made in Stage 1 (without pulling it too 'tight') and measure its length. Use this to work out how many of these strips you need to get the length described above. You can then work out how many basic strips you need to make up your long strip (you might need an abacus to help you here). Once you've made up your first long strip you can then spread it out (again without stretching it too 'tight') and double check that you've worked everything out correctly. Remember the old carpenter's saying, "Measure twice, cut once"! I found that, with a 40" chest and allowing room for a subarmalis (or other future expansion), that 15� basic strips were required. In other words, my long strip consisted of two rows of 310 square links joined by a row of 309 round links. Don't worry, the missing round link will arrive on the scene later! Now you're going to have to start really concentrating! Once you have a few strips of the correct length, as described in Stage 2, you can start to assemble them into something resembling a mail shirt. Essentially this involves joining the strips side by side, as you add more and more strips you are making more and more length on the shirt. To join the two strips together, first take one strip and insert a round link into Mickey's left cheek and ear of the first 'molecule' in the strip. Then hook Mickey's right cheek and ear from the first 'molecule' of the second strip. Now close the round link. It should now look a bit like this (though your strips will be much longer!). Now add a second round link to join up the second and third links of each strip. It should now look something like this. Continue until the two strips are joined up along their entire length. Now you can think about joining the two ends of the strips together to form a round 'cylinder'. This cylinder will go around your body (poor thing). This is achieved in exactly the same way that you would join two 'molecules' together. I joined each strip up into a cylinder as I added it to the main body of the shirt, rather than make up a big flat sheet and then joining all the ends of the strips together. This was principally so I didn't get confused as to which way round the whole thing was meant to go! You basically keep going in the above style until the cylinder is long enough (i.e. you have joined up enough strips side by side) to reach from your groin to under your arms. Once you have done this you need to start thinking about leaving arm holes. Essentially you now start make up strips that are long enough just to reach from one armhole to the other. You may think that means half as long as the strips you were making before, but you would be wrong! A Roman legionary is nothing if not fashion conscious, and therefore requires a tailored mail shirt. So, the strips across the front of the mail shirt actually need to be a bit shorter than the ones that go across the back. I was told to halve the total number of (square) links in a strip, then take 4 links off for the front and add four links on for the back. So, in my case, there are 151 square links on the front of my shirt between the armholes, and 159 square links on the back between armholes. Now it's time to put together the finishing touches! Firstly, as you continue adding rows to the front and back, there will come a time when you should split each row into left and right halves, and then shorten each row as you continue. This will give a 'v' shape to the front and back to make a sensible hole for your head to go through. I basically made this up as I went along, and recommend you do the same (by this stage you will be pretty confident in your mail making techniques so have the confidence to judge what to do here!). Of course, you can always take sly glances at other soldier's shirts to get an idea of what to do. Secondly, when you get to the top, you will discover that the rows on the front of the shirt are going in a different direction to the rows on the back (when you've spent some time making up the mail this will make sense to you). I solved this by using two rows of round links to form the 'seam' across the tops of the shoulders. The finishing touch is to sew some strips of leather around the neck hole to avoid the links scratching your delicate skin. You are now the proud owner of a mail shirt! If you are anything like me, now is the time to give the whole thing a rest. You have a shirt that you can wear to shows, no-one will send you home for not having shoulder doubling. However, after a while, the thought that you really should have that doubling will get too strong. So, pick up your pliers for the final onslaught! Basically, I suggest you have a look at how other soldier's doubling works and decide on the best approach to making yours. I made mine as a flat sheet (that now sits across the back of my shoulders) and then adding strips on the left and right that come across the top and are secured at the front by the clasps. The very front section is narrowed even further to give a sort of L section. Mine is secured part way down the back of the main shirt with the larger links used (see the list of ingredients above) for extra strength. I leave it to others with more knowledge to say whether this is more authentic than the arrangement where it is joined at the back of the neck and then extends in both directions (I can't describe this any better, but if you want to see what I mean look at Pacatianus's mail). So, now you really are the proud owner of a fully functioning mail shirt!